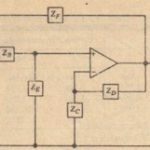 In this chapter, we will explore some useful an: aplications of operational amplifiers. In connection with several of these. 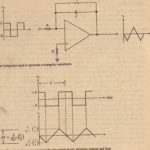 ve will introduce some important conccnt« i:l lnding oscillation theory. filtering, and wavcshuping, that have broad yond just their relevance 10 upcrutionul-amplilicr circuits. Unless otherwise noted ..we will assume that the operational umpliflcrs arc ideal. ‘enough to ideal that we can ignore small deviations from theory caused ie gain. finite input impedance. and nonzero output impedance. Wl! have seen tl at it is possible 10 scule a signal voltage. thai is. to multiply it b) ” Iixed constant, through an appropriate choice of external resistors that determine the closed-loop gain of an amplifier circuit. This operation can be accomplished in either an inverting or noninverting configuration. t is also possible to sum several signal voltages in 01 e operationa -amplificr circuit and at the same time scale each by a different factor. For example. given inputs Vio V~. and VI, we might wish to generate an output equal to 2vI -:- O.5V2 + 4u.l. The latter SUIll is called – ‘inear combination of VI. V2, and v,, and the circuit that produces it is often calk rl a.earcombination circuit. 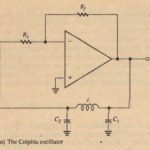 An inverting amplifier circuit that can be used to sum and scale three input signals. 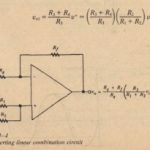 Note that input signals U” V2, and v.: are applied through separate resistors HI, R:, and RJ to the summing junction of the amplifier and that there is a single feedback resistor Rro Resistor R,. 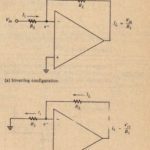 is the offset compensation resistor discussed in Chapter 13. 2. Write an expression for the output and sketch its waveform when VI 2 sin wt V, Vz :::: +5 V de, and V3 = -100 V de. 2. v” = -[4(2 sin wt) + 1(5) + O.I(-100)] = -8 sin wI – 5 + 10 = 5 – 8 sin wt. This output is sinusoidal with a 5-V offset and varies between 5 – H = -3 V and 5 + 8 == 13 V. It is sketched if’ Figure 14-3.
in those applications where a noninverted slim is required, it can also be obtained using the inverting circuit of Figure 14-1, followed by a unity-gain inverter.